Their fathers Peter (1858-1929) and Frans Tolf (1852-1928) were brothers. And so Ranghild Katarina Henrietta (1889-1973) and Eva Mathilda (1891-1957) were first cousins. Eva had a sister named Pearl May (1883-1967). The three women got together often. As a matter of fact, Pearl lived with Ranghild and her family in the 1910 census. Then in 1913 Pearl married Algernon Chastaine Porter. Their marriage was short-lived. A few months before Pearl’s wedding, Eva had married Carl Clifford Hedrick. 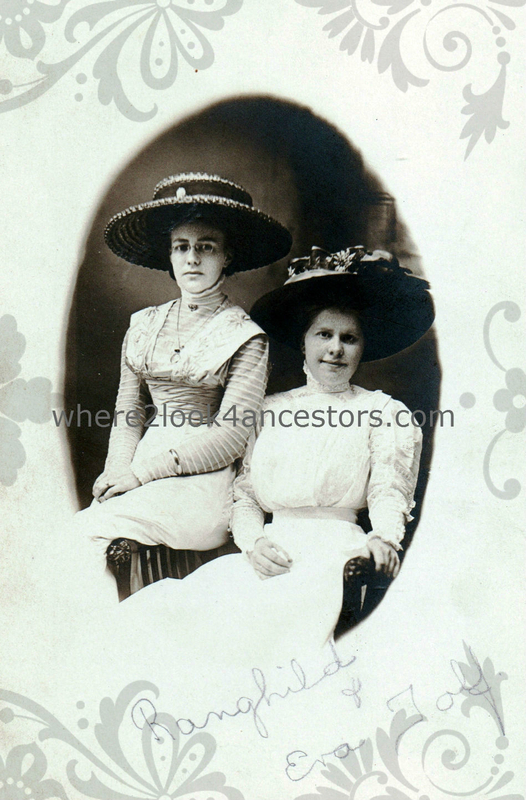 Together they had three daughters; Elva Marie, Leona Louise and Louise Virginia. At the time of Carl’s death in 1970, the couple had six grandchildren and four great-grandchildren. Ranghild never married, but she was a most welcome participant in family gatherings throughout her long life. I wish I knew which event prompted this photograph, it’s one of my favorites! What great hats! That is one thing I have noticed about my relatives–they were plain dressers, for the most part. No photos with hats like this except on the branch that left Kalamazoo for Seattle LOL. Aren’t they fun? This is one of my favorite family photos.